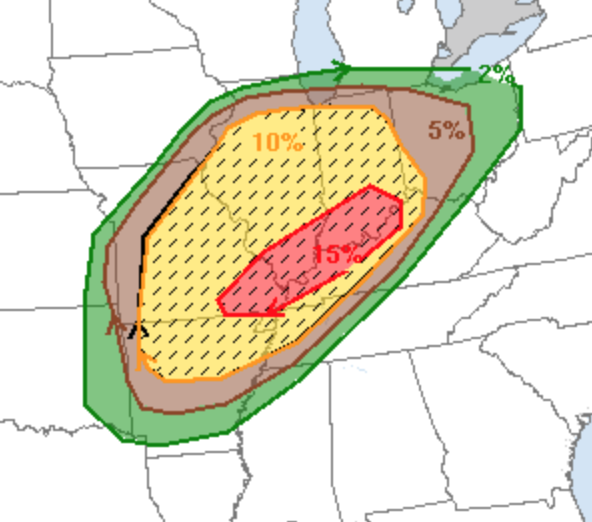 The NWS's tornado risk is unchanged from earlier with the exception of the 10% (yellow) being expanded in Missouri to include Sedalia, Warrensburg and Kirksville. Please scroll down for preparation suggestions. One of the reasons I am urging you to put your car in the garage isn't just the risk of tornado damage but also the high risk of giant hail. 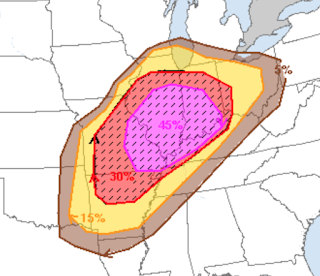 This map has a significant probability threshold of 15% (yellow). The probability of 45% is quite high. 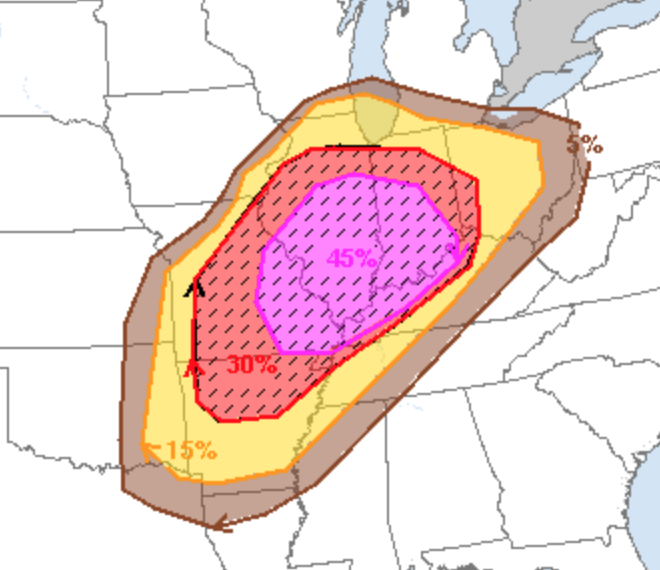 The hatching is the area where hailstones larger than 2" in diameter are forecast. So, get those cars in the garage! The first severe thunderstorm warning has been issued (in Missouri). So, it is time to complete the preparations if you are in one of these areas. Make sure you have at least two sources for receiving warnings. If one includes a NOAA Weather Radio, make sure the batteries are fresh and that it is turned on. If you need a second source, the AccuWeather smartphone app will provide warnings for your area. But, if you decide you want to use it, download it now (before any storms form) and set it up. Have your computer and cell phone fully charged. Put your car in the garage and bring in trampolines and other outdoor furniture. Make sure your shelter area is ready to go with a flashlight and take your warning source into the shelter with you. Wear shoes into the shelter. In the unlikely event you are hit, you don't want to be walking through glass and nails in bare feet or socks. While I will not be live-blogging the storms, I'll update at least once this evening.